In another dominating performance, FC Barcelona progressed to the semi-finals of the UEFA Champions League after slotting three goals past Manchester United at the Camp Nou. From the first whistle until the last one, the home side never stopped attacking Ole Gunnar Solskjaer's men, resulting in a masterclass from the five-time UEFA Champions League winners. Here are the five things that clicked for Barcelona. It was just another night where Barcelona saw most of the ball and had a lot of time to pass it around. A staggering 680 completed passes for Ernesto Valverde's wards just showed how comfortable these players are in moving the ball around. The Manchester United defence just seemed to be dumb-founded whenever Barcelona passed the ball around as they looked to be confused as to who will get the ball next. With Barcelona passing the ball around, it gave a lot of openings for their key players like Lionel Messi, Luis Suarez and Philippe Coutinho to operate in the front and menace the defenders. It wouldn't be a Champions League semi-final without Lionel Messi. He was all over the defence against Manchester United and the goals he scored were simply magical. His first goal came off from a magisterial move after nutmegging Fred on his way to the goal before firing just outside the box to score the first goal of the match and his first goal in the quarter-finals since 2013. For his second goal, Messi needed a howler from David de Gea to see the ball roll to the back of the net. De Gea thought he had it covered only to find the ball rolling beyond him and into the goal. Not only did those two goals show how dominating La Pulga could be, but his dribbling skills were also on display. He made it past the defenders like they were not there. It was just another night of magical Messi in display and we'll never get tired of watching him. After quite a long time of finding himself or staying behind the shadows of the past, Philippe Coutinho showed everyone that his time at the Camp Nou is not yet done. With his trademark curler from outside the box, Coutinho slotted the final nail in the coffin on the 61st minute in fantastic fashion. It has been tough last few months for Coutinho, especially the last few weeks as rumours of him going to Manchester United or PSG have been doing the rounds. But last night, he proved to be the man we expect him to be and his celebration said it all. He won't care about what people say about him, he'll just get the job done. He might be in a slump in their domestic league but in the Champions League, Coutinho has already scored three goals and set up as many in 10 matches this season. He surely knows when to deliver. They are at home and comfortable. Whenever they play in front of their home crowd, FC Barcelona just exude a lot of confidence and swagger in their game. It seemed like they are being orchestrated by the chants of the crowd and it was just a delight to see. 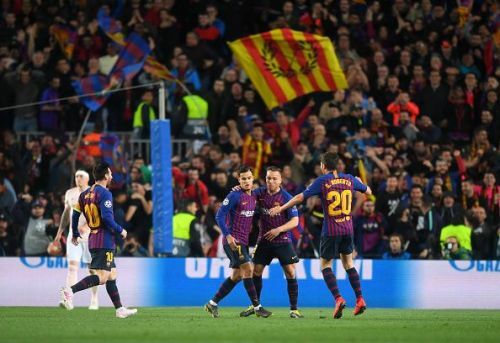 For 90 minutes, they just kept the ball moving around the park, making the defenders chase, and, of course, seeing Messi score twice on a Champions League night made the Camp Nou faithful delighted. Barcelona have set their sights on the treble and they are not stopping until they get there. Marc-Andre ter Stegen's performance last night can be summarized in just a line from a famous song by the band Oasis: "Because maybe, you're gonna be the one that saves me, and after all, you're my wonderwall"
Though he could give some credit to his defence for helping him keep the clean sheet, Ter Stegen still had to work for it, especially in the dying minutes of the match. On the 90th minute, Alexis Sanchez met a lovely cross from Diogo Dalot with a diving header but the German saved the Chilean's effort. With the way things are going for Ter Stegen, he's definitely keeping the wall up and making sure no one gets past him. This is just the thing Barcelona need in order to continue their winning ways.